While it’s tempting to call him the “Father” of French Cusine, in reality, Francois Pierre de la Varenne, was one of three Fathers to the great art. The other two being Antoine Careme and Auguste Escoffier. Thus, Francois Pierre deep-sixed the cinammon, cloves, myrhh and other goodies from the three wise men, and brought on the parsley, sage, rosemary and thyme. His (for those) times “revolutionary” idea being that the natural flavor of the ingredients should dominate, and not be smothered by and in heavy sauces. As you would expect, vegetables now took the pole position, with meat bringing up the rear. And, ever the ground breaker , he introduced an exotic meat from the far away lands to his recipies- a thing called – Turkey. Cleary on a roll, La Varenne replaced crumbled bread for stock with roux, introduced the first bisque and béchamel, and began using egg whites for clarification. He’s also credited with an early form of Hollandaise sauce. 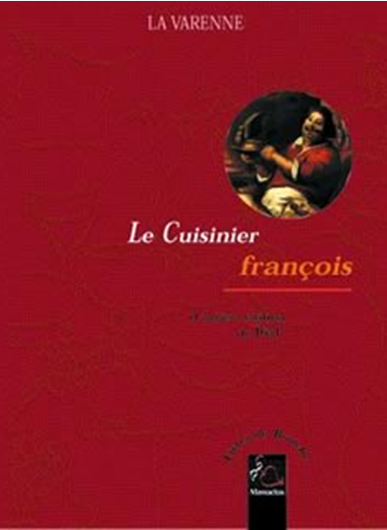 Not content with just all this innovation and creativity, Francoise Pierre put quill to paper, and produced “Le Cuisinier Francois.” Regarded as the founding text of modern French Cuisine. In it, he systematically detailed, according to rules and principals, the considerable advances that had been made in 17th Century French Cuisine. 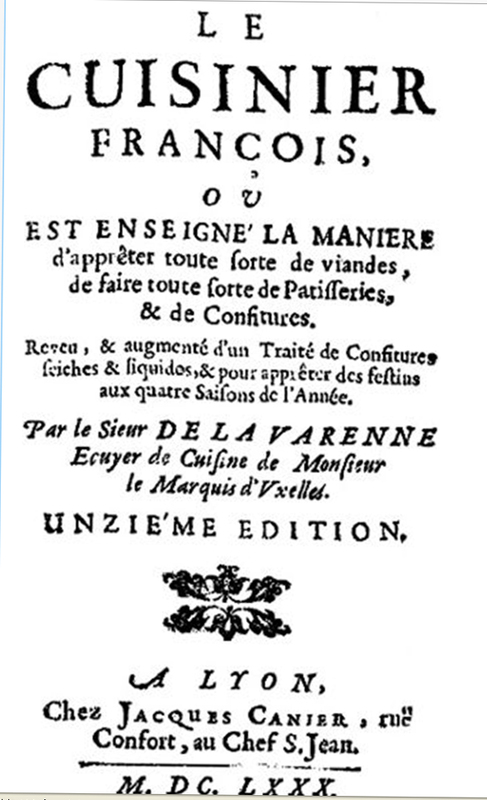 Francois Pierre, however, unlike Duxelles, did not get to be immortal. He went to that big kitchen in the sky at the age of 63. (Old for the 17th Century.) But his writings and recipies, copied, printed, re-printed continue to circulate, and most importantly – inspire. Not a bad legacy, eh wot? This guy and this history were totally unknown to me before I read this post. Thanks for the education. Like one of your other readers La Varenne was unknown to me. Fascinating history! Very informative post…..expecting from your mention of Careme and Escoffier that you’ll be sharing their stories as well? You pack more good no fluff info into a sentence than most other writers do in a paragraph. Guess that’s what makes you an AUTHOR, not just a writer? Heavy sauces are still on the menu for one (living) French Chef that I can think of. And his publicity photos confirm he’s been enjoying his own cooking! Most people who are not familiar with French cooking imagine it began and ended with Julia Child. Good to see you attempting to expand the knowledge of culinary horizons and traditions. It’s been said before, but it bears repeating – the way you present information makes every sentence a pleasure to read. Especially subjects like this one, where the information is readily available(if you look for it) – but dry and boring. You put it into an enjoyable (and informative) context. Your otherwise excellent post failed to mention that there were two other serious cuisiners in the 17 century, also writing for a professional audience. Saving them for another post, perhaps? if i’m not mistaken, “duxelles” is often used as a sauce, or a base for a sauce for fish. 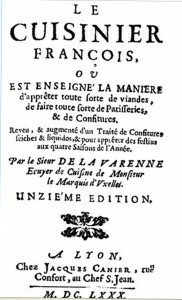 Your readers may be interested to know there was an English translation of La Varenne’s book, entitled – “The French Cook. 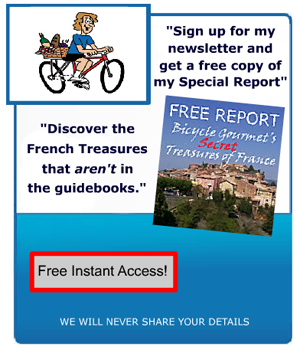 Delighted to see the French Cycling Gourmet finally sharing his knowledge specifically about French Cuisine! good to have some earlier history of French Cuisine…..important i think to know how today’s cooking styles originated. 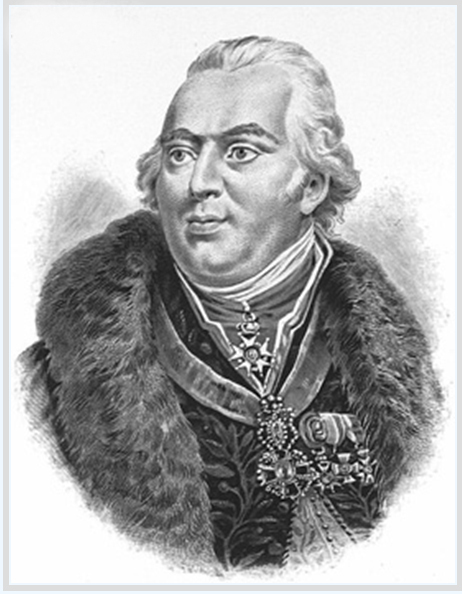 From your descrption of his methods and ideas, it seems that if La Varenne were alive today, he would fit right in to today’s French Cuisine….particularly his fondness for herbs and vegetables. As one of your other readers remarked, La Varenne’s innovations would be considered absolutely cutting edge if he were cooking today. fter reading this post very much looking forward to your profiles on the other two “Fathers” of French Cuisine. Good stuff! 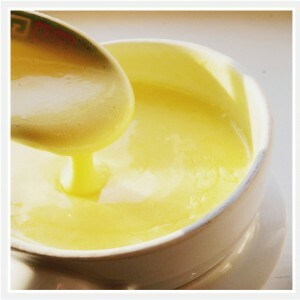 I’m curious about “early form of Hollandaise sauce.” Was he credited with the invention?……or just the first go at it? i’m wondering how many(if any) of the so called “gourmet chefs” on TV realize the majority of their “original dishes” began with La Varenne? Appreciate this post very much,as I’m just getting started with French Cooking…..and this gives me even more enthusiasim. Appreciate the effort and content…, good work!